InterPlay uses the Object Editors to display the Objects. You can create several Editors for each Object and you can use the same editor for several versions of the same Object Type. The structure of the Object Editor is defined as follows. On the Details tab, enter the Object Editor general information and select the Object Type the editor must be associated with. See Specify Object Editor details. In the table on the Element Editors tab, add as many Element Editors as there are in the associated Object Type. See Specify Element Editor details. 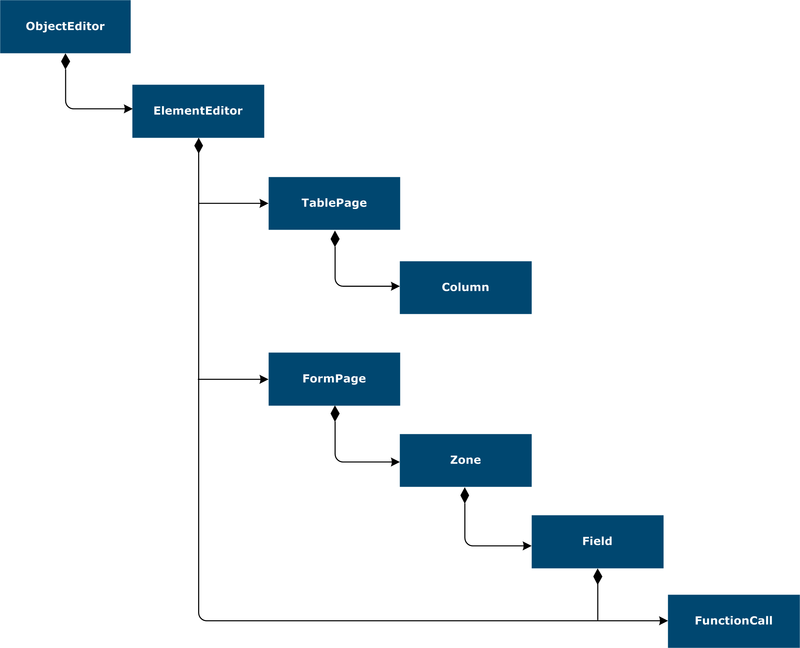 An Object Editor is composed of a set of Element Editors, one for each level of the Object Type structure that the Object Editor is associated with. Select an Element Editor to display the Element Editor Details tab. On the Details tab, enter the Element Editor general information and select the Object Type the editor must be associated with. See Specify Object Editor details. On the Table Page tab, add as many Table Pages as required to list the objects of the different types. For each Table Page specify Table Page general information and columns Properties. See Create a Table Page. On the Form Page tab, add Form Pages to display the properties of the Element. See Create a Form Page. In the table on the Function Calls tab, specify the function calls for the Editor. See Specify the function calls. Repeat steps 3 to 6 as many times as there are Element Editors in the list. On the Details tab, enter the Object Editor general information and select the Object Type the editor must be associated with. InterPlay Designer generates an editor for the Object Type and an Element editor per sub-element defined directly or indirectly on the Object Type. Editor labels are stored in the dictionary specified in the Object Type. A Form page that contains a default zone that contains the property of the Element. When the Element has sub-elements: a Table page that contains columns that map on the properties of the sub-elements. To generate a default editor automatically when the object is edited, check the option Generate default editor in the corresponding collection type.